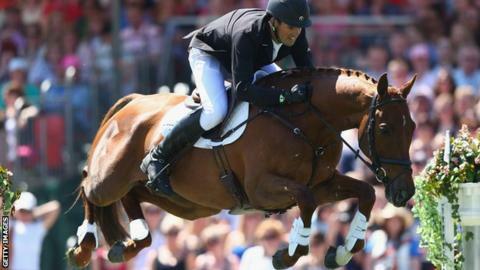 New Zealand rider Jonathan Paget is set to lose his Burghley title after his horse failed a drugs test. Paget, 30, and Clifton Promise were provisionally suspended last month after the horse tested positive for the banned tranquiliser Reserpine. A B sample has confirmed the result and Paget's Burghley title is set to be taken away at an Equestrian Federation (FEI) tribunal early next year. Paget said: "I will continue to work... to provide a full explanation." Clifton Promise was tested following his victory at the Burghley International Horse Trials on 8 September. Equestrian Sports New Zealand (ESNZ) chief executive Jim Ellis told ONE News: "What this now means is a rule violation has occurred and Jock [Paget] must now provide a plausible and satisfactory explanation to the FEI over the coming months." Ellis said he was "confident" Paget would be able to do so but added: "The Burghley title will be lost as a result of this, the rule violation makes that automatic. "The FEI's tribunal will consider a period of suspension, taking into account the evidence and the facts of the matter. I really can't pre-empt that."